Cooked radishes? Not on my radar. It was always my understanding that radishes are to be served raw with butter, black bread and a bit of salt. Dina Cutrone, a personal chef (not mine!) has taught me otherwise. I have stopped by her booth at the Union Square Greenmarket for two weeks in a row and each time have come home with an idea for a side dish. Each week she prepares something to showcase market ingredients and hands out samples. Last week it was asparagus with spring garlic, this week, radishes with spring garlic and chives. 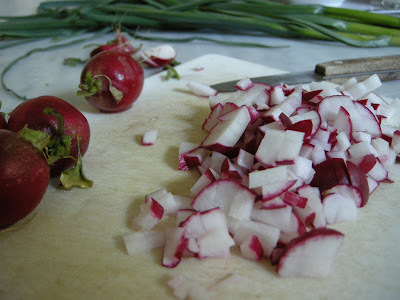 Last night we had the diced radishes with spring garlic. Sauteing the radishes mellows their flavor substantially and making them kid-friendly. They are pretty to look at too. I paired this dish with grilled steak and potatoes. While I was cooking, Izzy was eager to sample it. Once on his plate, he ate his steak and potatoes and left the radishes. I noticed them sitting there, all lonely on his plate, and managed to entice him to finish them. Which he eventually did, happily at that. How did I do it? That is a story for another day. For today I say, buy radishes and dice them, you will not be disappointed. 1. Dice radishes and finely slice white and light green parts garlic. 2. Saute garlic in a tablespoon or two of olive oil until soft, then add radishes and saute 5-10 minutes until softened. Season with sea salt and pepper to taste. 3. Whisk 2 tablespoons of apple cider vinegar with 3 teaspoons agave, then add 4-6 tablespoons of olive oil or to taste. Pour over sauteed radishes, sprinkle with chopped chives and serve. Sounds good. We had radishes last night. radishes and cucumbers sliced thin with maldon salt, pepper, good olive oil, and seasoned rice wine vinegar. I'm not a huge radish fan but this was a summer delight along with halibut and Ina Garten's fresh corn salad (corn, red onions, basil and vinaigrette) Dinner tasted like summer despite the weather. That sounds good. Maybe that will be my next radish dish.